WEST KELOWNA, B.C. - Prime Minister Stephen Harper called upon the ghost of Sir John A. Macdonald during a comic but partisan foray into British Columbia's marijuana debate. 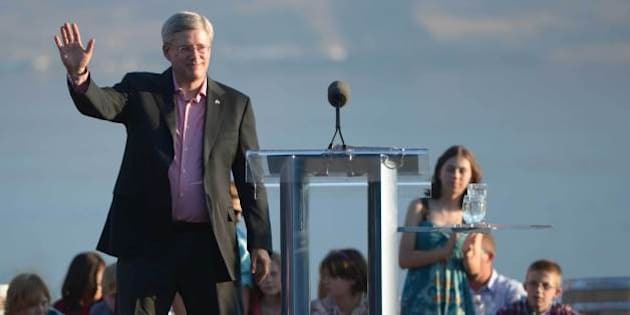 Harper cracked some jokes Friday evening during a barbecue attended by about 600 people at the Quails’ Gate winery in West Kelowna, not far from where Liberal Leader Justin Trudeau announced in late July that he supported the legalization, taxation and regulation of marijuana. A debate on marijuana legalization is currently taking place in the province. Pot activist Dana Larsen is trying to use initiative legislation to propose a law that would decriminalize marijuana by preventing police from enforcing simple possession laws. Just minutes into his speech, Harper referred to Macdonald who, according to the Parliament of Canada's website, was elected to represent Victoria, B.C., in Ottawa in September 1878. "Sir John A. spoke to British Columbians about the things that matter, about jobs and prosperity, about a Canada united and strong, about economic growth not grow-ops, about a national dream, not a pipe dream." The crack drew applause and laughter from the crowd. Yet, Macdonald's reputation was far from pure, as anecdotes abounded in the 19th Century of the politician swilling gin in the Commons and vomiting on the hustings. "Better John A. drunk than George Brown sober" was a political slogan of his day. Still, Harper thanked fellow Conservatives who were behind a bill that will allow him to bring B.C. wine back to Ottawa. "Now of course, I don't, you know, I don't drink alcohol, but I have lots of friends who do," said Harper. The barbecue wasn't the first time Harper has entered the marijuana debate. In late August he hammered Trudeau, accusing the federal Liberals of promoting pot use among children. "Do I seem like I smoke marijuana?'' Harper asked in response to a reporter's question during a media scrum. Trudeau, however, has said he has received "almost universal" praise for his admission that he smoked pot after being elected to Parliament. "The conversations I've had with Canadians have almost universally been about people pleased with the level of openness and transparency that a Canadian politician is demonstrating," Trudeau said in late August. The push for decriminalization has gained steam in B.C. over the past few years, with several prominent former politicians, including former provincial Liberal attorney general Geoff Plant and former NDP premier Ujjal Dosanjh, calling for the legalization and regulation of marijuana. Their group, the Stop The Violence B.C. Coalition, has pointed to opinion polls that suggest a majority of British Columbians agree with them. But the provincial Liberal government has largely opted to ignore marijuana reform, pointing out that drug laws are in the federal government's jurisdiction. During the most-recent provincial election campaign, Premier Christy Clark ridiculed her NDP opponent for even taking a position on the issue. Meantime, Elections BC announced in July that Larsen could begin collecting signatures for his Sensible BC campaign on Sept. 9. To succeed, Larsen must collect the signatures of 10 per cent of registered voters in each of the province's 85 ridings by November. That would either force a vote in the legislature or a provincewide, non-binding referendum.